Oil Painting Medic: How do I Paint Pectin on Grapes? Subtle features on still life objects such as the pectin on the skins of grapes or condensation on strawberries may often be overlooked in preference to the fruits’ colour mixture or shape. The fruit painting may turn out as expected, but the still life misses something, an extra factor that could make the still life great. 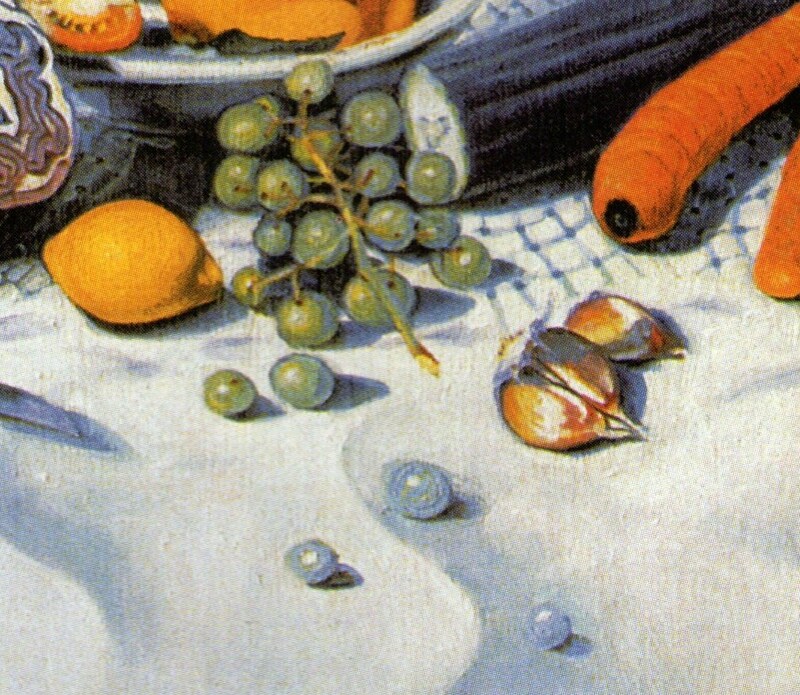 What art techniques can the artist use to suggest pectin on grapes or water droplets on food? Perceiving objects in symbolic and idealized ways and reflecting this in the painting. For example, grapes are small round objects, often found in bunches, that are either green or maroon in colour. A white dot can be used to suggest a highlight and a dark crescent for the darks. Working in alla prima (in one paint layer), may not permit the artist the scope to make small modifications to the grape painting necessary to capture the essence of pectin or similar subtle effects. Making do with cheap oil painting materials such as inferior brushes for exacting processes, or not having sufficient colours in the palette to attain the subtle colour mixes needed for specific purposes. Painting fruit and observing other still life artists’ work will inevitably raise visual awareness, which will in turn cause the artist to critically anaylise past paintings and perhaps feel dissatisfaction. This is a good sign, as the artist is beginning to see things in a more sensitive way. The following method can be used to suggest pectin on fruit. Photographs with high resolution of grapes are essential for detail. If painting grapes from life, keep the grapes in the fridge between painting sessions to keep them fresh. As with most painting techniques, work from the basic to the particular. Simplify the grapes into basic tones and shapes and record them onto the painting surface. Render the grapes as though without pectin, but see beyond it to the colour beneath. Use a little linseed oil to achieve a flat glaze. Brush out ridges and troughs. Allow this initial paint layer to dry. The next glaze concerns the pectin. Mix a colour slightly paler than the colour used for the grapes. If the grapes are green, add a little white to the green mix. Dab a little of this colour onto a narrow filbert sable. Don’t load too much and don’t add linseed oil, or the mixture will become runny. Gently wipe surplus pigment onto a soft cloth until the bristles are lightly coated with the pigment. Aim for a fine, almost flaky consistency to the paint. Lightly “scumble” the paint over the grapes concerned. Don’t apply the paint evenly or thickly. Allow the paint to drag over the painting in a broken glaze in an effect like lightly applied crayon. Darker areas of the grapes, such as shadows should be darkened slightly accordingly. Pectin can also be suggested by dragging the paint over a painting completed on fine texture such as canvas. This will suggest the dustiness of pectin, as some areas will be darker than others. See my video clip on how I painted pectin on grapes in alla prima. Like the dustiness of pectin, observing the lusciousness of fruit, rather than the mere shape and colour of the fruit itself, will help create a super-real still life. Again, good photographic reference is essential. Paint the fruit (in this case, strawberries) as though no highlights or water droplets can be seen. Apply the paint thinly where the highlights will be placed. Once the colour and hues of the fruit has been blocked in, mix white with a hint of pthalo blue and a little linseed. Observe the shape of the highlights, which will vary in shape and size. In the strawberry painting, the highlights vary from linear flecks to doughnut-shapes. 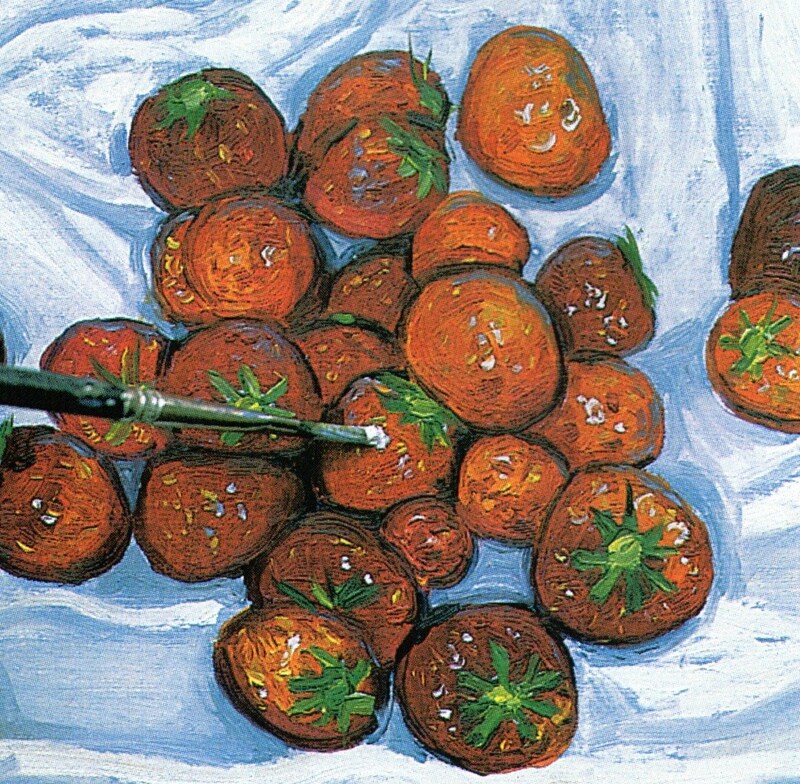 Place strategically around the fruit, ensuring the outlines of the highlights remain sharp. Moist highlights will sometimes exhibit adjunction of dark linear shapes which are deeper than the general colour of the fruit. These dark convolutions hold the key to making the surface of fruit appear luscious rather than merely smooth or shiny. Like the highlights, these dark areas will vary in shape and size. Ensure the outlines remain sharp. Recording subtle observations in objects, such as fruit is key to creating a still life with super realism. Pectin on grapes or water droplets on strawberries, for example, require small touches, but could transform a painting.